"Barbara is a true glass-ceiling-breaker in the world of media. From a time when a woman would not be taken seriously reporting hard news, her relentlessness, bravery, intelligence and vision has changed the landscape of television journalism. Her skillful, timely and probing interviewing, her ability to ask the questions the public would most like to hear, and her fearlessness in challenging the world's most powerful leaders, has made her one of the most influential journalists in the history of television, and has provided us with a deep chronicle of the people that influenced the latter 20th century and a big chunk of the 21st Century" ~~ Gloria Steinem , Co-Founder of The Women’s Media Center, will present the Trailblazing Media Award to Barbara Walters. Quotes and photos throughout this blog will be updated after the event. Bookmark and visit frequently. 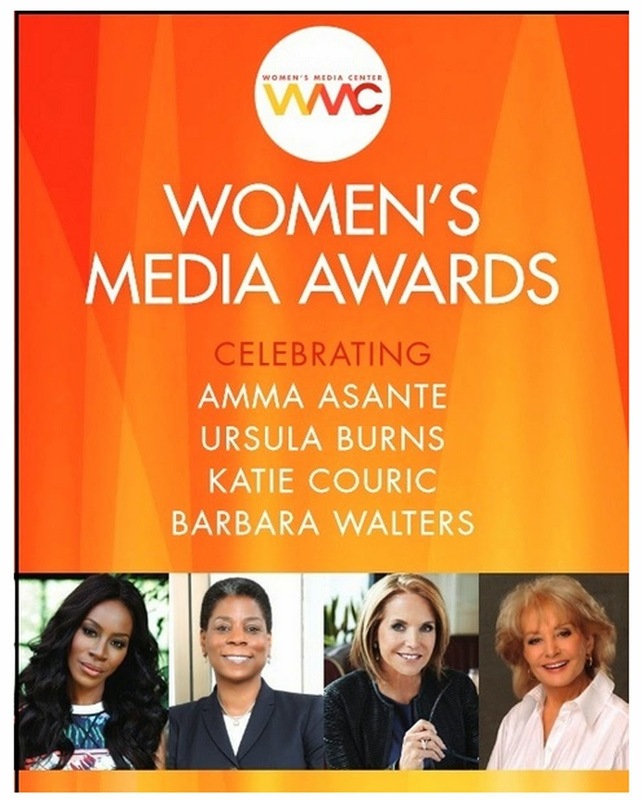 Photo above left of Amma Asante, Ursula Burns, Katie Couric and Barbara Walters courtesy of James Grant PR and WMC. Enjoy the "see what you missed" photo album of The Women's Media Awards Gala 2014 on Facebook and stay tuned for the "see what you missed" video. 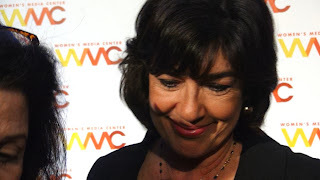 On Wednesday, October 29, 2014, celebrities, personalities, feminists, artists, business and media leaders gathered for The Women’s Media Center 2014 Women’s Media Awards. The event was hosted by Joy Reid – Joy Reid, host of MSNBC’s “The Reid Report”. Co-founders Gloria Steinem and Robin Morgan were among the presenters. ♦ Ursula M. Burns, chairman and chief executive officer, Xerox Corporation - WMC Carol Jenkins Visible and Powerful Media Award. ♦ Barbara Walters, creator & executive producer of “The View,” and ABC News special correspondent -WMC Trailblazing Media Award. The Social Media Award went to Elianne Ramos, Principal and CEO of Speak Hispanic Communications and Founder of the Border Kids Relief Project. Ramos, (@ERGeekGoddess) also a Latino community advocate and is known as one of the most influential Latinas in social media. Ramos has a phenomenal online presence as social entrepreneur and is dedicated to various advocacy programs. The social media honoree is selected online by twelve distinguished digital journalists, bloggers, and thought leaders. 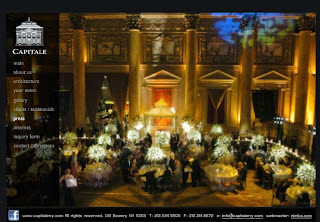 The full house, sold-out event was held at Capitale, http://capitaleny.com/ , a Beaux Arts architecture building located on the lower east side of New York City. 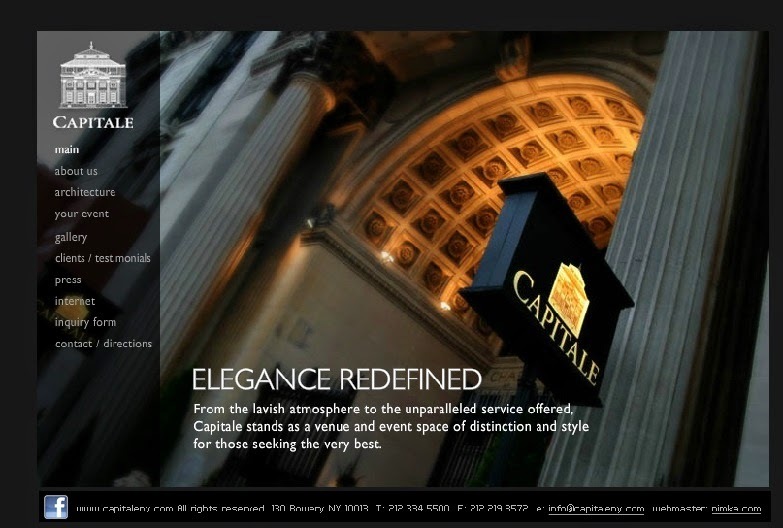 Known for its opulence décor, Capitale features a 65-foot ceiling with an art glass skylight, spectacular interior Corinthian columns and marble mosaic floors throughout. Photos above left, exterior and below right interior dinner reception hall at Capitale from Capitale Web site. This event marks the 6th annual awards celebration which recognizes individuals who have made outstanding contributions to advancing women’s and girls’ visibility and power in media. The WMC 2014 Women's Media Awards event is co-chaired by Jane Fonda, Robin Morgan, Gloria Steinem, Gayle King, Loreen Arbus, Pat Mitchell, Martha Nelson, Carol Jenkins, Jewelle Bickford, Lauren Embrey, Jodie Evans and Gloria Feldt. Photo below left of Jane Fonda from WMC 2013 event by Gloria Buono-Daly. Photos will be updated throughout with Women's Media Awards Gala 2014 soon. Bookmark and visit frequently. The Social Media Award will be presented to an honoree to be announced. The honoree is selected online by twelve distinguished digital journalists, bloggers, and thought leaders. "Social media has brought news and differing perspectives to the world and changed the conversation...It is where the power to make significant change exists today," ~~ Jane Fonda, two-time Academy® Award-winning actress, humanitarian, activist and Co-Founder of The Women’s Media Center, as quoted during the Women's Media Awards Gala 2013. ◊ Marlo Thomas, four-time Emmy-winning actress, producer and activist. ◊ Julie Burton, president of the Women’s Media Center. ◊ Pat Mitchell, president & CEO of The Paley Center for Media, Women’s Media Center Board chair emerita, former Women’s Media Award honoree, co-chair of the Women’s Media Awards. ◊ Lauren Embrey, president and CEO of the Embrey Family Foundation and CEO of Embrey Interests, Ltd., board chair of The Women’s Media Center, co-chair of the Women’s Media Awards. ◊ Donna Deitch, award-winning film and television director, co-chair of the Women’s Media Awards. ◊ Sheila C. Johnson, founding partner of Black Entertainment Television, CEO of Salamander Hotels and Resorts, vice chairman of Monumental Sports & Entertainment, president and Managing Partner of the WNBA’s Washington Mystics, co-chair of the Women’s Media Awards, and past Women’s Media Award honoree. ◊ Bonnie Schaefer, former co-CEO and co-chairman of the board of Claire’s Stores, Inc.,co-chair of the Women’s Media Awards. ◊ Regina K. Scully, Artemis Rising Foundation founder, social documentary filmmaker,founding sponsor of “Women's Media Center Live with Robin Morgan,” founding sponsor of WMC Press, founding sponsor of Athena Film Festival in New York City, co-chair of the Women’s Media Awards. ◊ Mary and Steven Swig. Mary Swig is the founder and CEO of Mary Green Enterprises. Steven Swig is founding co-chair of Presidio Graduate School. Both are co-chairs of the Women’s Media Awards. ◊ Carol Jenkins, author, former WNBC anchor, former and founding president of The Women’s Media Center, contributing writer for The Huffington Post, board member of The Women’s Media Center. ◊ Maggie Wilderotter, chairman & CEO of Frontier Communications, past Women’s Media Award honoree. ◊ Clive Davis, five time Grammy-winning Chief Creative Officer of Sony Music Entertainment, Co-Producer of Diva Classic and founder of Arista Records and J Records. ◊ Carolyn Jane Maloney, U.S. Representative for New York's 12th congressional district. ◊ Melissa Mark-Viverito, Speaker of the New York City Council. ◊ Martha Nelson, past editor-in-chief and editorial director, Time Inc. and former Women’s Media Award honoree. ◊ Ehab Al Shihabi, CEO, Al Jazeera America. ◊ Vanessa De Luca, editor-in-chief, Essence. ◊ Anne Fulenwider, editor-in-chief, Marie Claire. ◊ Richard L. Wolffe, Vice President and Executive Editor of MSNBC.com and MSNBC commentator. ◊ David Corn, Washington Bureau Chief for Mother Jones & Analyst for MSNBC/NBC News. ◊ Blake Morgan, musician, singer-songwriter, music producer and CEO of ECR Music Group. ◊ Roger Hickey, co-director of the Institute for America's Future. ◊ Lois Sasson, Jewelry Designer, Lois Sasson for Sasson Thomas. ◊ Janita, recording artist, singer-songwriter. The Women’s Media Center 2014 Awards represent a powerful, influential, emerging, and engaging media force. Facebook album will be available soon. In the meantime, there are many photos posted of the 2013 Gala on Facebook album titled The Women's Media 2013 Women's Media Awards. 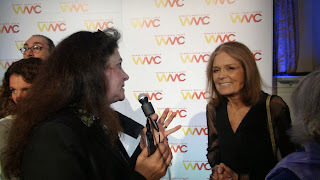 Photo right Gloria Steinem by Gloria Buono-Daly taken from the Women's Media Awards Gala 2013. 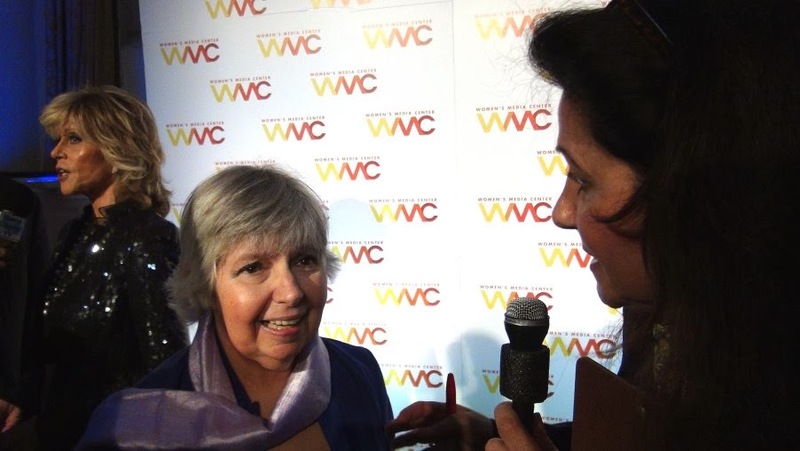 Here's the "see what you missed video" from Women's Media Awards Gala 2013. Enjoy and stay tuned for the "see what you missed video” of the Women's Media Awards Gala 2014.